The D400 Heavy Duty Access Covers are both silent and strong. Ideal for areas with fast-moving traffic, these manhole covers can withstand 40 tons. 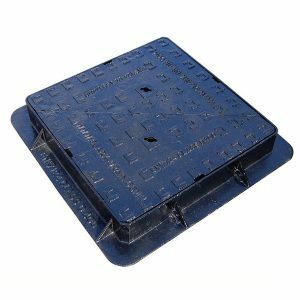 These heavy duty manhole covers are made with the ultimate weight to strength ratio. These manhole covers are designed with three-point suspension. Are you looking for the right heavy duty manhole covers for heavy traffic areas? If so, these manhole covers from Fiberpol are the perfect option for you. Made with a non-rock, three-point suspension, these manhole covers are silent, stable and strong enough to withstand up to 40 tons. These heavy duty manhole covers are black bitumen coated and made to last.